If Mick qualified for the semifinals, he would be the champ. 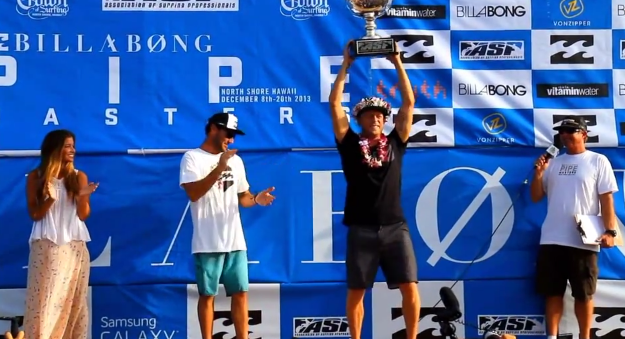 If Mick didn't reach the semis, and Kelly won the Pipe Masters outright, Kelly would win his 12th title. Round 5: CJ vs. Mick: The pressure was on and neither surfer could get anything going; Mick had 8 waves scored and his highest wave was a 2.50! CJ was scraped together 2 short barrels for a 6.87 and a 3.67, and with 1:30 left on the heat clock, things looked grim for Mick. But then out the back came a monster set wave, and Mick capitalized, nailing a deep barrel (with a serious claim) for a 9.50, moving on to the quarters and keeping the title alive. Quarters: Yadin Nicol vs. Mick: Mick's opponent in the quarters was Yadin Nicol, who himself had world tour re-qualification on the line, and came out on fire early in the heat, landing back-to-back 9.33 and 7.57 barrels to put serious pressure on Mick, needing a 9.57 to advance. Once again, with under 2 minutes in the heat, it looked like Mick's day was done, but once again, a big set out the back gave Mick a shot. It could have been a replay of his Round 5 wave - a bottom turn into a deep barrel - and after getting spit out of the wave, he rode into the beach as the clock expired. With Mick standing on the beach, the judges still hadn't scored the wave, with the title riding on their decision. The scores were posted - 9.7! - and Mick was carried up the beach by his mates to celebrate his 3rd title. Kelly Wins the Pipe Masters: What made Mick's win even more dramatic was that Kelly (obviously pissed) went on a tear after Mick clinched the title, blasting Seabass, Parko and John John and winning the Pipe Masters, meaning that if Mick hadn't pulled out those two waves (or if the judges had scored the quarters wave lower, as Kelly thought should have been the case), we'd be talking about Kelly's epic comeback for his 12th world title. That should be some serious motivation to keep Kelly hungry come next year.